Arsher Ali as Phil, Sam Troughton as Dom, Rafe Spall as Luke and Robert-James Collier as Hutch. 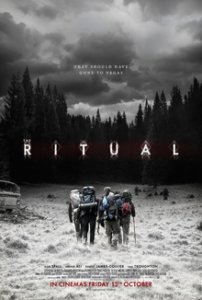 The Ritual is a British horror film based on Adam Nevill’s book by the same name. It was released on October 12, 2017 by Netflix. This review is spoiler-free. As always, the only time I share spoilers about a movie or tv show on my site would be if I needed to warn my readers about potentially triggering material in it. There was nothing like that in this film. The premise of The Ritual is a simple one. 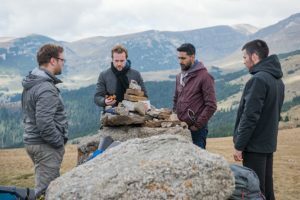 After losing an old university friend to a random act of violence, Phil, Dom, Luke, and Hutch went hiking and camping in a remote corner of Sweden to spend time together and honour the memory of their deceased friend. About a day into their trip, Dom tripped and accidentally injured his knee. The group still had many kilometres to go through the mountains on their hike, and none of their cellphones could get a signal in such a remote location. The four characters decided to take a shortcut through the woods so that he could rest and get proper medical attention as soon as possible due to these factors. A violent thunderstorm began soon after they entered the woods, so the characters sought refuge in an abandoned cabin for the night despite their deeply uneasy feelings about the property. They broke up a piece of the house to start a fire, and then settled down for a good night’s rest before hopefully continuing their journey in the morning. As they were about to discover, they should have listened to those feelings. The cabin wasn’t abandoned after all, and the person/entity/thing who lived there wasn’t pleased by their trespassing at all. (I must be purposefully vague on this point in order to avoid giving you too many hints about who or what these characters angered). My main criticism of this film has to do with how similar all four of the characters were. Phil, Dom, Luke, and Hutch all had fairly outgoing, sarcastic, and jovial personalities that tended to blend into one another. There also wasn’t a lot of information given about their backstories. What were their occupations? Were they married or otherwise in longterm relationships? If they weren’t single, were their partners men or women? Did they have kids? The references to their adult lives were so sparse that I still don’t know the answers to these questions for all four of the main characters in this storyline. As nice as it was to have some of these questions answered for some of them, I thought it was odd that such basic information wasn’t provided for everyone. I had a difficult time thinking of them as individuals because of this. While I’d certainly expect such a tight-knit group of old friends to share many common interests, it would have been nice to have more character development before the plot picked up so that I could remember who was who when they did make rare references to their personal lives. Sharing details about who they shared their lives with and what occupations they had would have gone a long way to separating these characters in my mind. There’s nothing wrong with a plot-driven storyline, but I do think this one would have been even better if it had taken more time to show who the characters were before putting them into terrible danger. There isn’t much I can say about the antagonist without giving away major spoilers, but I was much happier with how this portion of the plot was handled. The backstory was well-developed and fit into the storyline nicely. I especially liked the fact that it took the characters as long as they did to learn anything at all about what was lurking in the woods. This wasn’t a case of characters knowing in advance that a particular spot had a bad reputation and deciding to explore it anyway. They had no idea what they were about to stumble into after the thunderstorm began, and that made the later events of the plot even more exciting than they would have otherwise been. It also provided plausible deniability for why they didn’t immediately leave the cabin they were staying in the first time something frightening happened in it. In my opinion, horror movies are most enjoyable when the characters genuinely had no idea what they were getting into before the first bizarre things happens to them. One of the things I always want to know before I watch something from this genre is what sort of horror we’re talking about. Is the plot gory? Does the fear the characters and audience feel mostly come from anticipation, or will we actually see whatever it is that seems to be roaming around in the woods and hunting them down? Do the characters react sensibly the first time they sense something is horribly wrong? Once again, I’m dancing around spoilers here, so bear with me if I don’t fully answer all of your questions. The first thing I’d say about the plot is that it is firmly planted in the horror genre. If you love being scared, there are plenty of spine-chilling scenes to come when you begin watching The Ritual. I had to watch a couple of scenes from the corner of my eye because of how scared I was for the characters in them. As far as the gore goes, it definitely existed. This isn’t something I’d recommend to people who have a phobia of blood or gore even though the scenes that included those things were only a small part of the storyline overall. I don’t like slasher movies, and this wasn’t one of them. The build up to the moment the characters realize the cabin they’ve broken into had never been abandoned at all was handled nicely. Honestly, the storyline was just as much about that moment as it was about everything that happened afterwards. This isn’t the sort of tale that has any sort of profound messages about death, grief, or friendship woven into it. I’m not criticizing it by saying that, either. Not everything in life needs to be deep in order to be enjoyable. This is a classic horror film in every way, and the characters fit into that genre beautifully. If you love the horror genre and are in the mood for a satisfying scare, I would recommend this film.